Welcome to Hull University Swing Dance Society! 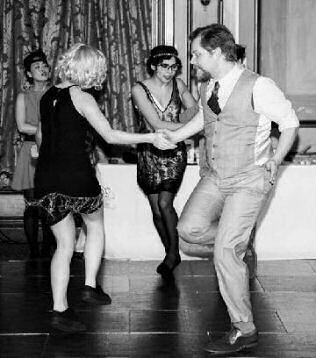 We run weekly Lindy Hop and Charleston classes at the University of Hull, along with social dances, workshops and socials to get to know the group. Our sessions are only available during term time for the university and run from 19.30 on Tuesdays in Asylum of University House HU6 7RA. We hold two hour long classes with a chance to social dance between each one. We charge £1.50 for students or £3 for non-students for both classes. We mainly focus on Lindy Hop and Charleston but we hold regular workshops in a range of different things such as aerials, lindy hip Hop and routines. No previous experience or partner is required and you do not need to be a student to attend any of our events..
Kingston Swing and HUSDS are 'not for profit' organisations and we teach on a voluntary basis. This means all proceeds from the lessons can be reinvested into the group for the benefit of its members. Join our facebook group here : Hull University Swing Dance Society for up to date info.